Release Your Past. Empower Your Heart. Do you long for peace and genuine happiness? Do you wish to live your life free from shadows of the past? Are you ready to release the weight you’re carrying and open your heart? For most people, the answer to all of these questions would likely be a resounding “Yes!” Why, then, is it so difficult for us to see the limitations of our thought patterns and find the courage to overcome them? As we mature into adulthood, our ancestral and cultural conditioning often causes us to create boundaries and limiting beliefs, which hold us back from our natural state of boundlessness. We cut ourselves off from this powerful stream of grace, sabotaging ourselves with feelings of inadequacy and attachment to ego. The good news is that there is always a way back to this sacred place of boundlessness. And from this place, the impossible becomes possible. When we approach our individual challenges and perceived shortcomings with tenderness and love, we begin to cultivate our deeper wisdom and abundant capacity for fearlessness. The biggest obstacle is simply learning how to get out of our own way. When this happens, miraculous transformation and healing is possible – giving way to trust, resiliency in the face of hardship, health, vitality, and joy. You have everything that you need within you to reopen the gateway to your boundless and authentic Self. Trust and allow. Your time is now. We live in a world where many people are afraid to shine into the brilliance that is their birthright and their purpose. Stepping into our full potential can feel traumatic, for us as well as our family and friends. In this course, you will identify and surpass deep-seated fears with the support of Karena, a tribe of powerful yogis, and Divine guidance. Many of us are being called to heal ancestral patterns that have existed for years and years. We are here to heal and grow in the present, but also for generations before us, and for generations after us. In this course, you will learn to break free from self-sabotage and shift patterns engrained by your ancestors, with the help of Kundalini Yoga and the power of the collective spirit. You have everything you need, and at this time, the universe is calling you to heal and transform into your highest self. The biggest obstacle is learning how to get out of your own way so the Divine can work with you. In this course, you will plug into the electricity so your light can shine crystal clear in every aspect of your life. In this course, you will learn to recognize the power of the new age, where your radiance works for you. You will learn how to stop struggling upstream and instead attract from your magnetic presence. When you perfect the art of asking and allowing from your heart, everything will come to you naturally. Through the illumination of Divine love, you will learn to attract your heart’s deepest desires, in alignment with the universe. You will develop the capacity to use the body, mind, and soul as a sacred prayer, and begin to live through the heart rather than struggling to overcome the ego. According to Karena, this is the secret to it all. This course will provide you with the daily practices, inspiration, and renewed enthusiasm that can be used to awaken dramatic shifts in the core of your being. Karena offers simple, accessible, yet profound tools, based on years of her personal dedication to loving and living from the heart. Karena’s blend of Kundalini Yoga, meditation, and elevating lessons will allow your heart to remember what it already knows: that underneath all of the perceived stress and upheaval in our world, everything is at your fingertips – waiting in divine alignment. Waiting for you to energize that powerful voice inside of you that is crying out to shine. You are encouraged to work through the course at your own pace, with support from Karena and your fellow students. Explore what is no longer serving you and release long-held blocks, both known and unknown. By processing deep-seated energetic blocks, such as shame or insecurity, you will begin to experience profound shifts in both the body and the mind. Activate your awareness, your stillness and your capacity to expand outward. Increase your natural frequency of love and drop deeply into your heart center, supported by the unity of the entire group. From this place, you will begin shining your inner light to all you come in contact with. Gratitude is the highest form of yoga. Through your yoga practice and daily journaling, you will set intentions and tap into your divine purpose. Manifest, with gratitude, all that you were meant to share with the world. Discover the power of prayer and move through the chaos of life. Increase your resonance with the miracles and abundance inherent in the Universe. With humility and love, you begin to understand that you can ask for exactly what you are longing for. You are worthy and your prayers have been heard. Erase the chatter of the mind and know that your Soul is being deeply held. From this place, the flow of energy opens, allowing you to give deeply to yourself and to others. Celebrate your amazing commitment to yourself and your practice. Receive and acknowledge the abundant blessings that are your birthright. Access to a private Facebook group, moderated by Karena, where you can build relationships with a global community of yogis and share your experiences. Becoming Boundless course content and materials are valued at $700. This course is available for you to begin immediately! Today, we are offering it for just $349 $199! This course is available for you to begin immediately. Don’t delay — This special offer will only be available until 5/15/2018 11:59pm ET! You can still sign up for a FREE master class to Unleash Your Boundless Potential with Karena Virginia! This course is eligible for 10 hours of non-contact CEU’s with Yoga Alliance under the criteria for substantial education for an online course. Karena is a motivational speaker, energy healer, yoga teacher, mentor, and TV personality who shares simple yet transformational wisdom for the mainstream world. She began studying yoga in elementary school after a near-death experience showed her the beauty of bringing the angelic to the earth. She spent many years hiding her spiritual gifts working as an actress and model, but now shares her divine insight with a highly accessible and uplifting style. Karena encourages everyone to connect with their personal truth through love, compassion, inner beauty, and radiance. She believes love is the highest intelligence of the universe, and with love, all things are possible. Karena writes for The Huffington Post and was recently featured on Veria Living and Bravo TV. 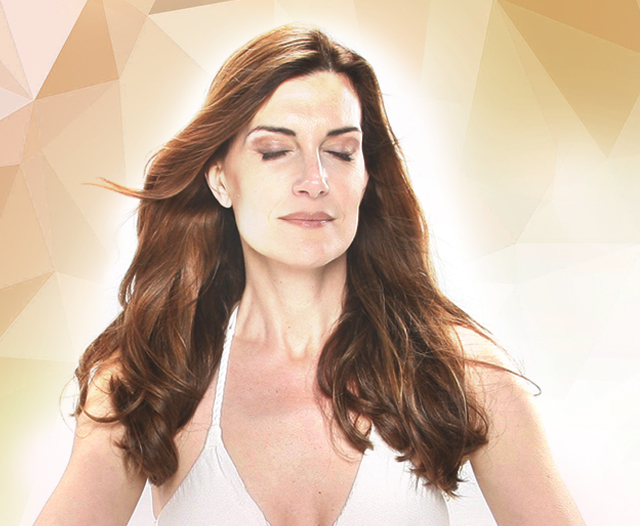 You can find her in the highly acclaimed DVD “The Power of Kundalini Yoga” or listen to her on the IOS app “Relax and Attract with Karena.” She also released her first book “Essential Kundalini Yoga” last year. Karena is married with two children and lives in the suburbs of New York City.